Aleesoft Free iPad Video Converter is an Apple TV video converter, 100% clean (No Viruses, No Adware, No Spyware). This video to Apple TV converter can help you convert video to Apple TV including H.264 and MPEG-4 codec, then let you enjoy video and music on your Apple TV. Apple TV is a digital media receiver made and sold by Apple. It is a small form factor network appliance designed to play digital content originating from the iTunes Store, YouTube, Flickr, MobileMe or any Mac OS X or Windows computer running iTunes onto an enhanced-definition or high-definition widescreen television. Apple TV can function as either a home theater-connected iPod device or a digital media receiver, depending on the needs of the user. 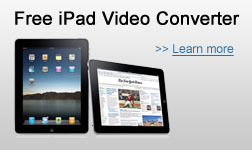 Before converting video to Apple TV, please download and install Aleesoft Free iPad Video Converter. Step 1: Choose output format. 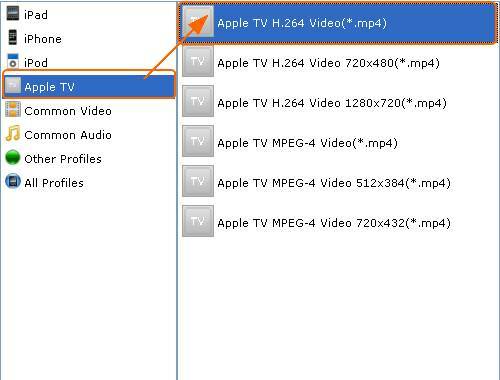 Click "Profile" drop-down list to choose an output media format for your Apple TV. Step 2: Add video. Click "New Task" button to add video to this Apple TV video converter, also you can drag and drop video file from windows explorer into this video to Apple TV converter. Step 3: Convert. Click "Convert" to start converting video to Apple TV. After conversion completed, you can transfer the converted Apple TV video file to your Apple TV and enjoy. Now download Aleesoft Free iPad Video Converter and start to enjoy the digital life of your Apple TV.